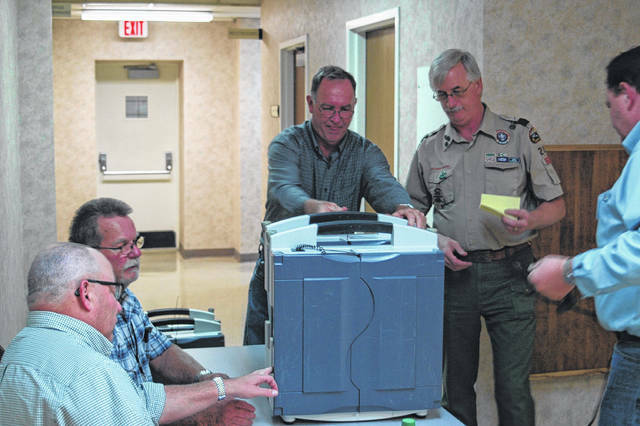 Local Boy Scout Troop 200 helped to carry ballot boxes to the second floor for precinct officials, a role they have performed for more than 15 years. Election officials processing voting machines as they come in, checking each machine for security and authenticity. 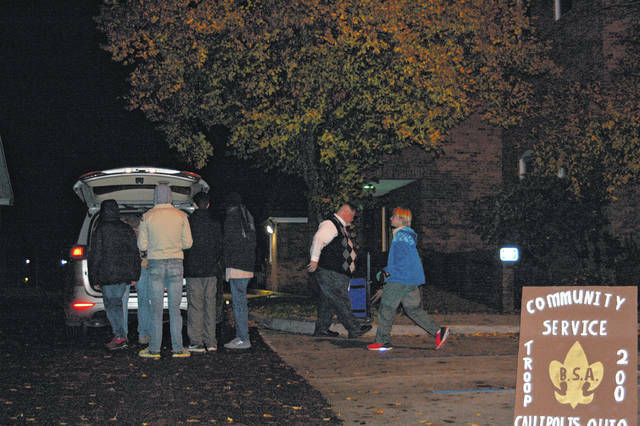 GALLIPOLIS — Reporting 25 precincts, Gallia County’s unofficial election results were tallied Tuesday evening with a number of major issues’ fates decided. Gallia voted yes to State Issue 1 Rights for Crime victims, 4552 to 1167. It also voted no to State Issue 2 Drug Price Relief Act 4856 to 864. The Gallia County Board of Developmental Disabilities one mill levy led with yes votes at 3586 to 2200. Gallipolis voted against the one percent increase income tax police levy, 342 to 308. Rio Grande’s fire and police levy was a mostly yes vote with 100 for and 21 against. The Rio Grande Community College levy vote was 2932 against and 2823 for. In Meigs and Vinton Counties combined, 3017 were for and 5178 against the Rio Grande Community College levy. Hocking County reported one no vote and no yes votes. The Jackson Times-Sentinel reported 2,220 for and 3,186 against in Jackson County. Raccoon Township’s fire protection levy was a yes, 372 to 86. Springfield Township’s fire levy passed 480 to 131. Lawrence County JVS millage issue had a 72 for vote and 60 against. The Courtside Sunday liquor sales option led with yes votes 129 to 83. Symmes Valley School Board saw Hope Rowe with 30 votes, John Sharp with 31 votes and Tommy Shepherd with 33. Chris Webb had 11, Derek Wilson 12 and Tammie Meyers 18. Three seats were open. Fairland School Board’s candidates saw Martin Appleton with 42 votes, Gary Sowards Jr. with 48 and Matt Ward with 41. Three seats were open. Gallia County School Board saw Jeff Halley with 1589 votes, Stephanie Mulford with 1379 votes and Brent Schultz with 1380 votes. Three seats were open. Gallipolis City School Board saw Lynn Angell with 1633 votes and Troy Miller with 1771 votes. Two seats were open. Stephen Saunders sat unchallenged to be part of the District 6 Gallia Vinton Educational Service Center with 604 votes. Douglas Pugh sat unchallenged for his seat for the District 4 Gallia Vinton Educational Service Center with 445 votes. Ruby Stanley led with 130 votes for Walnut Township Fiscal Officer. Lisa Shaffer came in with 33 and Shelby Davidson with 70. One seat was open. Springfield Township Trustee Scott Howell had 370 votes and Vaughn Taylor had 413. Two seats were open. For Gallipolis City Commissioner, Cody Caldwell led with 391 votes, Albert “Tony” Gallagher had 336 and Beau Sang had 348. Three seats were open. Centerville Village Council candidates saw Virginia Daniels get 24 votes, Gene Hall get 28 votes, Robert Terry had 23 votes and Brian Waugh had 21 votes. Four seats were open. Rio Grande Village Council saw unchallenged Cory Camden with 97 votes and Vinton Village Council candidate Denver Bates sat unchallenged for 47 votes. For Addison Township Trustee, Fred Burnett received 238 votes and Robert Rothgeb received 273. Two seats were open. Cheshire Township Trustee candidate Mike Conkle had 119 votes and James Taylor had 119 votes. Two seats were open. Clay Township Trustee candidate David Kerns received 246 votes. One seat was open. Gallipolis Township Trustee candidates Harry Dean Brownell received 525 votes and C. Ronnie Carmichael received 646 votes. Two seats were open. Green Township Trustee candidates David Graham received 770 votes while Seth Montgomery received 675 votes. Two seats were open. Green Township Fiscal Officer candidate H. Joe Foster received 930 votes, unchallenged. Greenfield Township Trustee candidates were led by Charles Chambers Jr. with 114 votes, Roy McCarty with 88 votes and Hayden Hammond with 86 votes. Two seats were open. Guyan Township Trustee candidates saw John Cardwell with 172 votes and Scott Ferguson with 99 votes. Two seats were open. Harrison Township Trustee candidate Margaret Adkins received 126 votes and Bobby Angel received 112. Two seats were open. Huntington Township Trustee candidates were led by Roger Shadwick with 207 votes, Jeffrey Oiler with 164 votes, Bryce Taylor with 126 votes, Tad Browning with 82 votes and Billy Oiler with 34 votes. Two seats were open. Morgan Township Trustee candidates saw John Manley with 153 votes and Jeff Ferrell with 112 votes. Two seats were open. For Ohio Township, James Waugh had 85 votes and Samp Johnson had 46 votes and Robert McGuire had 97 votes. Two seats were open. Perry Township Trustee candidates were led by Jeffrey Pope with 205 vote. T.Mark Hager received 172 votes and Bradley Davies received 122. Two seats were open. Matthew Roberts sat as the unchallenged candidate for Raccoon Township Trustees with 353 votes. Gallipolis Municipal Judge Eric Mulford sat unchallenged with 4798 votes.